1. Drain the cowpeas and rinse under running water. 2. Pressure with 1/2 to 3/4 cup of water for 10 minutes. 3. Add the ashgourd cubes, green chillies, salt and few curry leaves in a pan. 4. Pour 1/2 to 3/4 cup of water and cook over high heat for 15 to 25 minutes till tender. 5. Mash the ashgourd lightly and add the cowpeas. 6. Add coconut milk and allow it to simmer for 1 to 2 minutes. 7. Garnish with oil and little bit more curry leaves. 8. Mix well and serve hot. 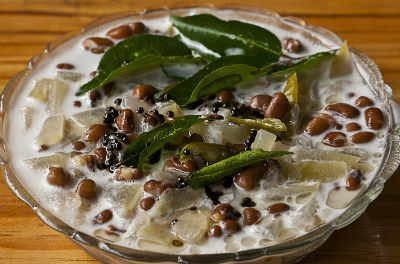 Feel free to comment or share your thoughts on this Kumbalanga Olan Recipe from Awesome Cuisine.